Perhaps this post should instead be titled, "The day my husband was sure I lost my mind." I'm pretty sure that's what went through his mind when he first saw these projects. His actual words were more like, "Oh. 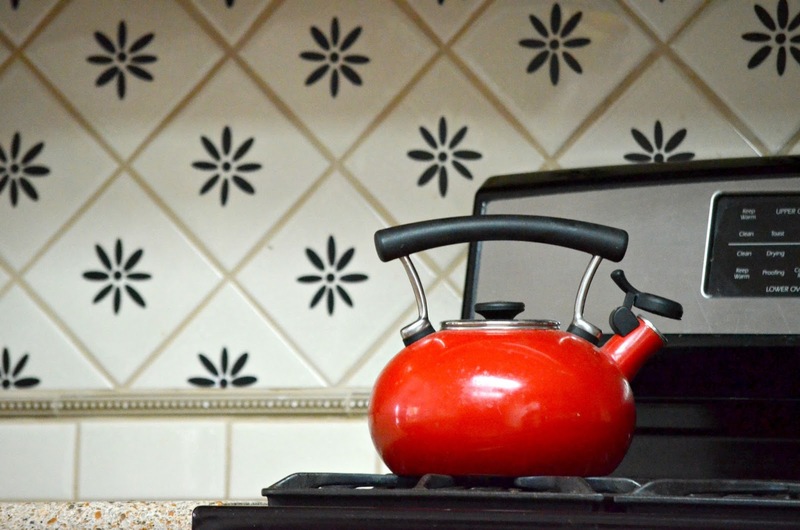 You STENCILED the backsplash." I assured him that no, no paint was involved. Just lots and lots of stickers. I think the color in his face started to come back at this point, but he still wasn't too sure about it. He is after all, a lover of all things neutral....and this project definitely wasn't neutral. 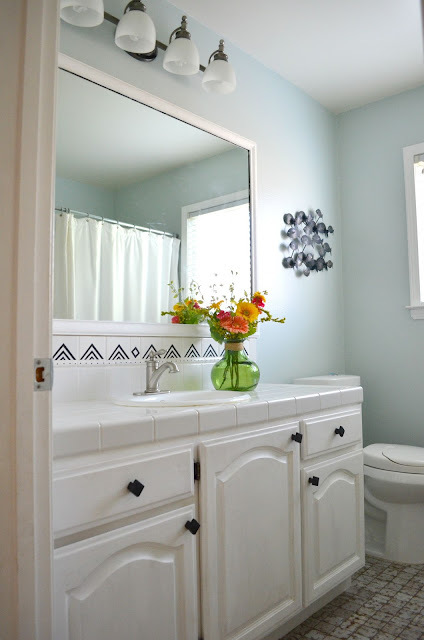 Do you remember my bathroom makeover a while back? 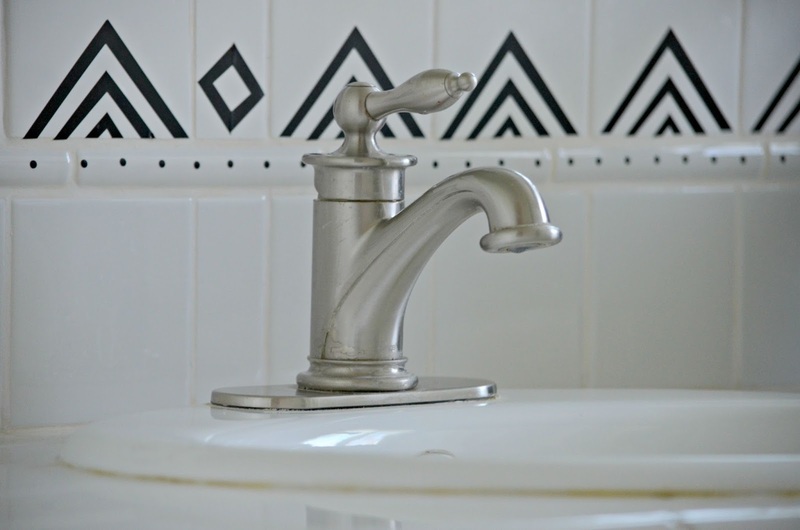 I played around with adding a a design to the backsplash in my bathroom, but it ended up just being temporary. This is temporary too--the design is just vinyl, cut out with my silhouette cameo--but hopefully they'll stay intact much longer than my Sharpie design did. 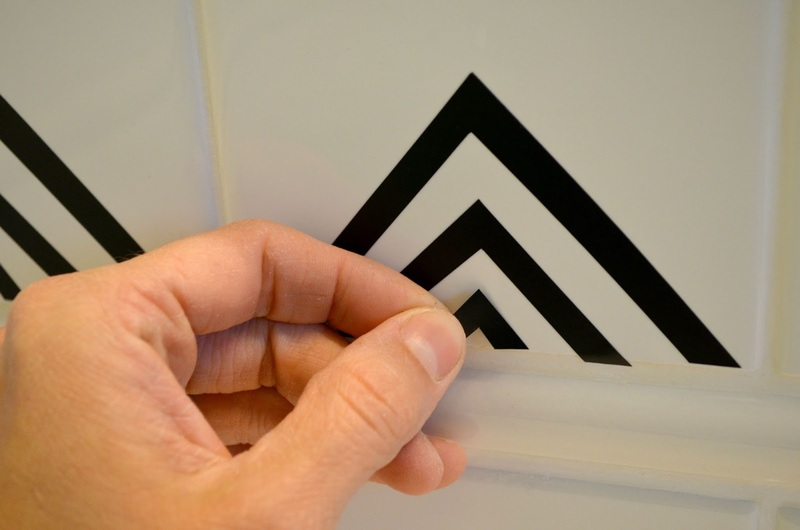 If you're not familiar with making vinyl decals, here are the details. You buy the vinyl in a roll, which you can either cut designs out of or use a cutting machine like I did. Then you just peel off the back and apply. Basically, they are stickers! You can re-position them as needed too, which is super cool. I just positioned them straight onto the tile back splash. After doing the bathroom, I still had the good portion of a roll left, and I started thinking about some of the tile designs I've seen lately on back-splashes. I've always been attracted to elaborate tile, but I don't think I'd ever have the guts to actually put it in my house, mainly because I'd be afraid that I'd grow tired of it. I'm not a big fan of my kitchen, or my kitchen backsplash, so I thought it might be fun to try a vinyl decal in there too. I figured that it couldn't really get worse, and maybe it'd just get better. I was inspired by this image. I don't love the kitchen design as much as the bathroom, but it's still fun. I love how much it changes the look of the room. When I finally finished putting on all the decals, the hubby came in and said, "You know what? I actually kind of like it." Phew. I think for now we agree that it's a nice change at least. I'm happy that they should be easily removable should we want to go back to how the back splash was before. 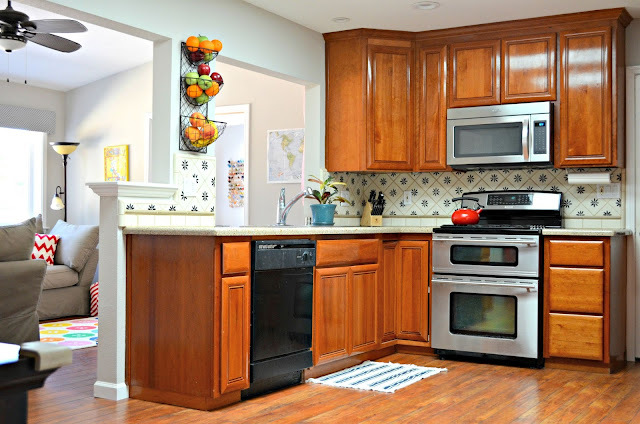 Or better yet, decide a kitchen makeover is in our future. What do you think? Would you ever try this simple makeover for your home? I did both rooms with one roll of vinyl, which seams like such a good deal for a makeover for less than $10! I actually used contact paper as my backslash in my kitchen..lol..i panicked!!! But i must say, it didn't turn out bad. Good idea tho!